← What lies in store for the state water bond? The peculiar pattern of rain California had this winter – virtually none in January and February – should remind us all that climate change is really happening now. “Abnormal” events will become increasingly frequent as our era of benign climate recedes. Dry winters are especially hard on native fishes that rely on streams and rivers flowing in a predictable pattern. Most native fishes likely had a hard time reproducing earlier this year because of the lack of high flows in the spawning season. Take the case of splittail, a large native fish that spends most of its life in the San Francisco Estuary but moves upstream to spawn in the winter. In Suisun Marsh, where I study fish, adult splittail did not bother to leave this winter, presumably because of the flows weren’t enough to draw them upstream. In contrast, consider the Sacramento sucker and pikeminnow in Putah Creek, which flows along the edge of the UC Davis campus. I sampled the creek with students in late April and found they had spawned successfully, leaving abundant young in the shallows. The reason: Putah Creek has a dam that releases water in the spring specifically to improve spawning of native fishes. The two cases point to both the problems of native fishes in a warming climate and solutions to these problems. Of the 121 native fish species still with us, 82 percent are likely to be gone in a century’s time as climate change accelerates declines of already depleted populations. By contrast, only 19 percent of the 50 species of fish introduced into California face a similar risk of extinction. 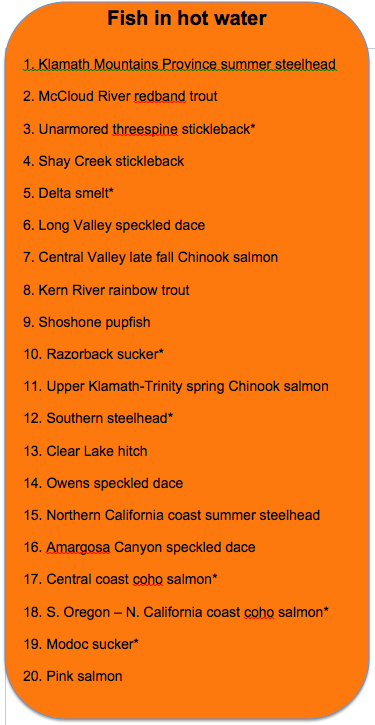 The top 20 native California fish species most likely to become extinct in California within 100 years as the result of climate change – if present trends continue. Species are listed in order of vulnerability to extinction, with No. 1 being the most vulnerable. Source: UC Davis * Species already government-designated as threatened or endangered. If present trends continue, most of the unique California fish fauna (63 percent are found only in the state) will disappear and be replaced by alien fishes such as carp, largemouth bass, fathead minnows and green sunfish. Vanishing fish will include not only obscure species of minnows, suckers and pupfishes, but also some of California’s iconic species: coho salmon and most runs of Chinook salmon and steelhead trout. I sincerely hope others using our methodology will prove us wrong for at least some of these species. But I seriously doubt that further investigation will change the faunal trend we have uncovered. As we Californians lose these fish, we lose part of the endemic flora and fauna that makes California such special place. 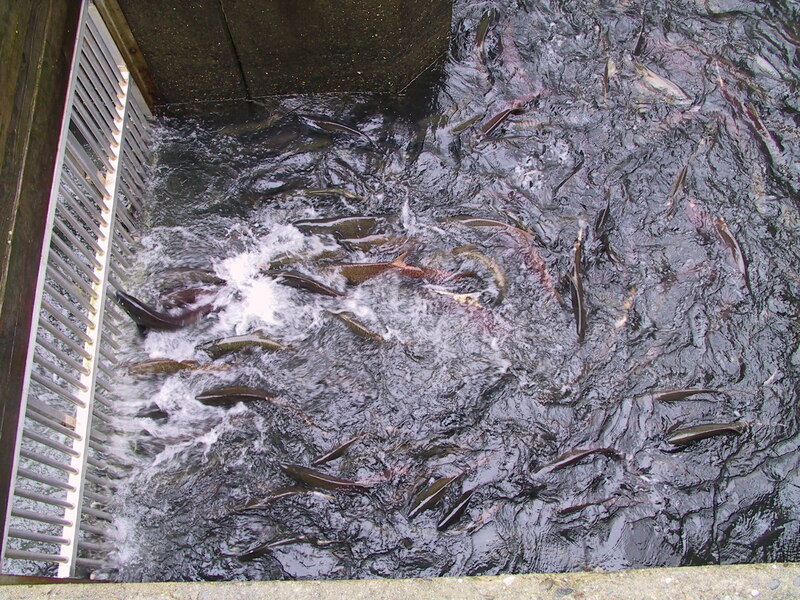 We will have homogenized fish fauna – the same carp and catfish found elsewhere in the United States and Europe. If California’s native fishes go extinct, most people will not miss them. The average Californian has little familiarity with these species. But many Californians will notice our cold-water streams and rivers turning warm, murky and, at times, completely dry. In protecting our native fishes we protect our clear, cold, high-quality water for drinking, swimming and sustaining other cold-water creatures including otters, mink, osprey and dippers. But it doesn’t have to be this way. We now have the tools to systematically evaluate fish species’ vulnerability to climate change so we can take preventative measures – including improved flows from dams. Future blogs will address ways to keep our native fishes and streams. 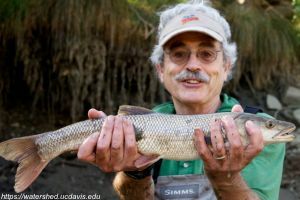 Peter Moyle is a UC Davis professor of fish biology who has been documenting the status of California native fishes for the past 40 years. Moyle, P.B., J. D. Kiernan, P. K. Crain, and R. M. Quiñones. 2013. Climate change vulnerability of native and alien freshwater fishes of California: a systematic assessment approach. PLoS One. This entry was posted in Uncategorized and tagged climate change, native fish, Peter Moyle. Bookmark the permalink. Could it be that the only salvation for cold water fish is the enlargement and construction of more dams that would be able to provide cold water for the fish? And also for people.